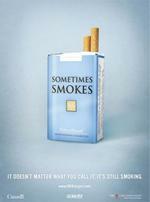 Hey, Sometimes Smokers are Smokers Too. The Question is, Do They Care? Adpunch blew this print campaign by Extreme Group, Halifax, in our direction. The ads put "social smoking" on blast for the cheap sham that it is. But excepting the Only When I'm Drinking Cigarettes (which lazy creative came up with that one? ), we can't help but think that toting a pack of Sometimes Smokes and Midterm Menthols would draw jaded giggles during just such situations. It would be just as funny as Shut the Hell Up Gum, which everyone always wants to try despite the implied pwnage. 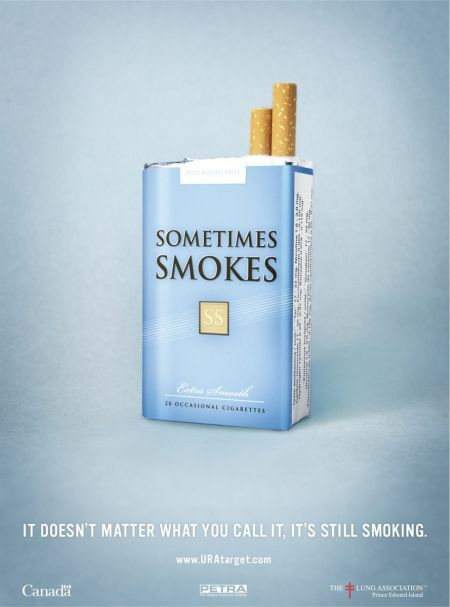 The print ads invite users to hit uratarget.com, where other tongue-in-cheek fare will again generate wry smiles from the same sometimes-smoking 20-somethings who learned in 5th-grade that smoking can lead to unsightly throat holes and emphysema. But hey, we'll quit when we're 25, so it's all good. Ugh, grammar must be dead these days. Except that I meant to say "excepting." We are excluding the Only When I'm Drinking Cigarettes - not, in fact, "accepting" them. Grammar may not be dead. But hey, critical reading just might be.